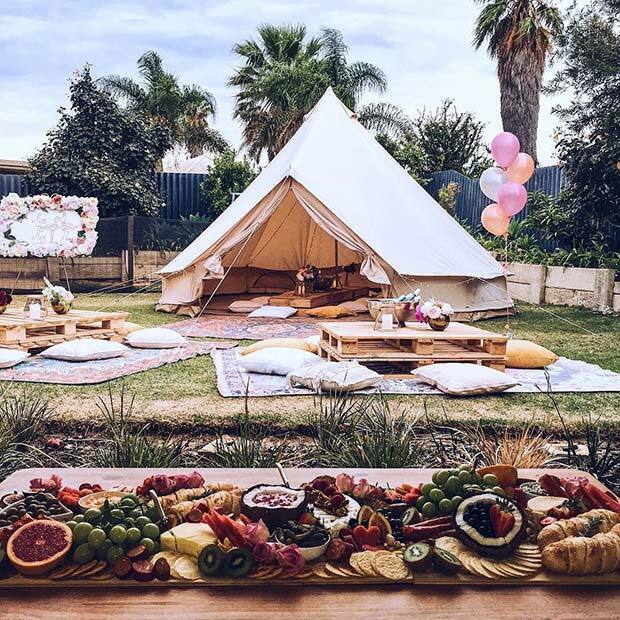 If you are having the bridal shower in the summer or if you have good weather, then consider having an outdoor bridal shower like this one. The area has palette tables, cushions, floral decor, a teepee tent and food. It would be a great choice for a bride-to-be who loves festivals and bohemian style. Fifty Shades of Grey is loved across the globe. So, it is no surprise that it has become a popular theme for bridal showers and other parties. 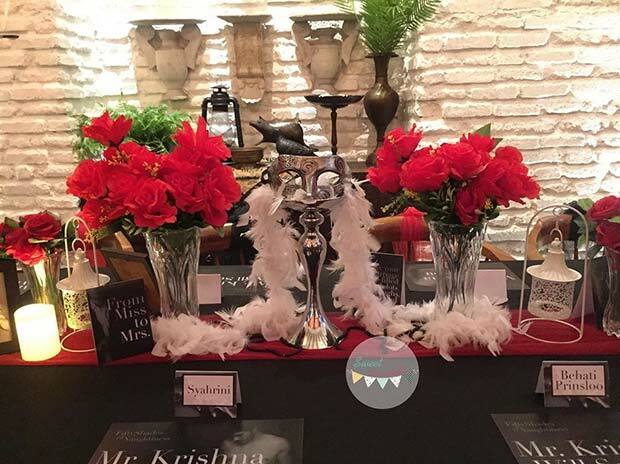 At this bridal shower there is decor inspired by the franchise. There are also movie inspired posters with the famous line Mr. Grey will see you now but Grey has been swapped for the groom’s name. This is a great theme idea that you and the guests could have a lot of fun with. Our next idea is perfect for the the brides-to-be who love all things creative, pretty and quirky. 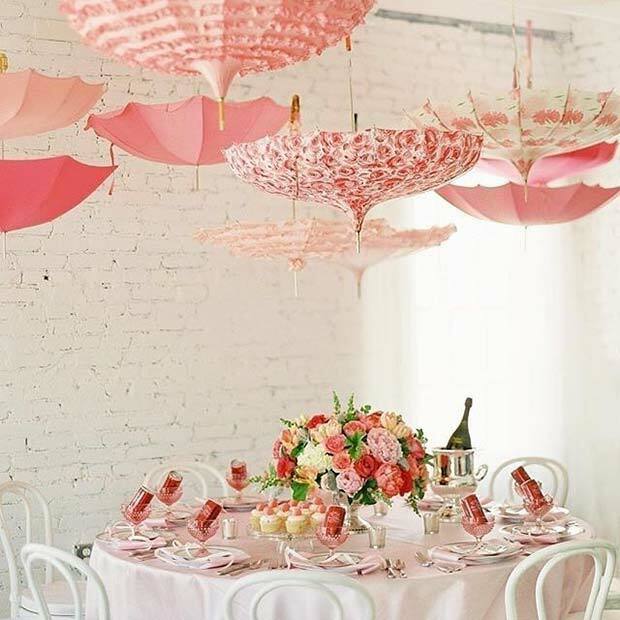 Here we have a table with umbrella decor. Decor like this would suit any shower, especially tea parties. You can choose umbrellas with any pattern and in any color. Maybe even have tropical parasols instead for beach and tropical showers. Use the image featured as inspiration for a romantic, tea party theme. Another popular theme is Alice in Wonderland. 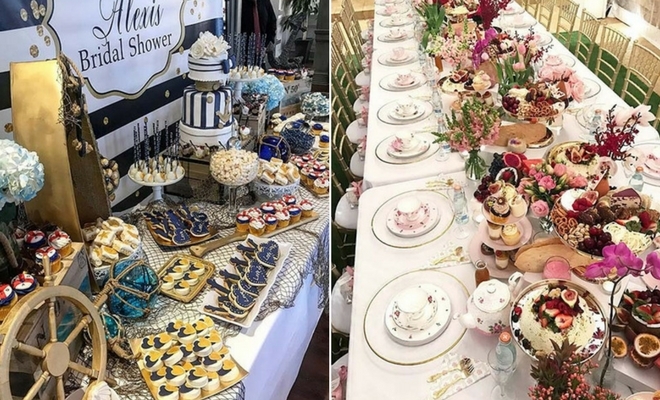 With this theme you can create a quirky tea party style bridal shower. 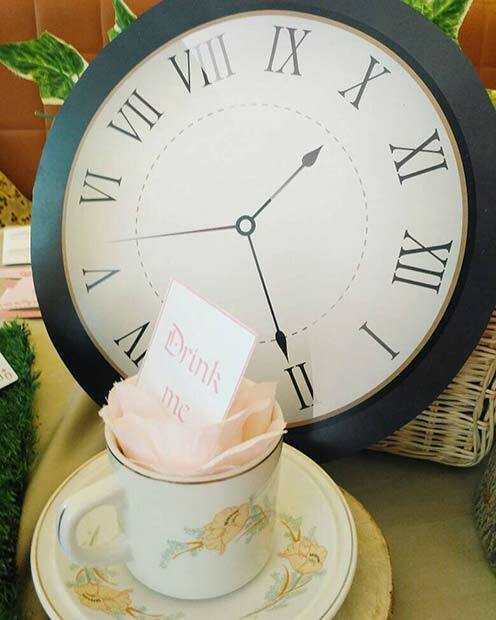 You can decorate the venue or area with clocks, drink me, roses and more. Use drink me labels on cups of tea or cocktails and add eat me signs to your cakes and treats. Many are choosing a rustic theme for their wedding. Why not have your bridal shower rustic too?! 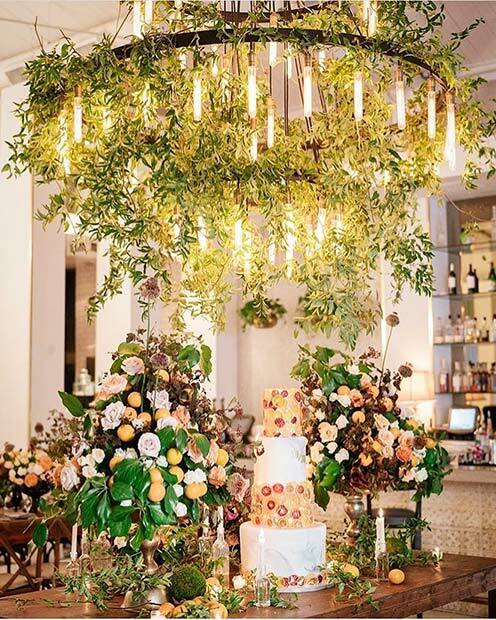 It is such a beautiful theme full of plants, flowers and natural decor. Here is an amazing example of how to decorate a room in a rustic way. You can take inspiration from this and create your own stunning rustic room. Maybe you don’t want a lot of colors, flowers and fuss. If that is the case, consider simple and romantic. You can just add roses in vases around the room. Have elegant table settings and beautiful food. As you can see, a simple white rose on a white plate looks stunning. You can use this theme for your own shower. Unicorns are loved by people across all ages. 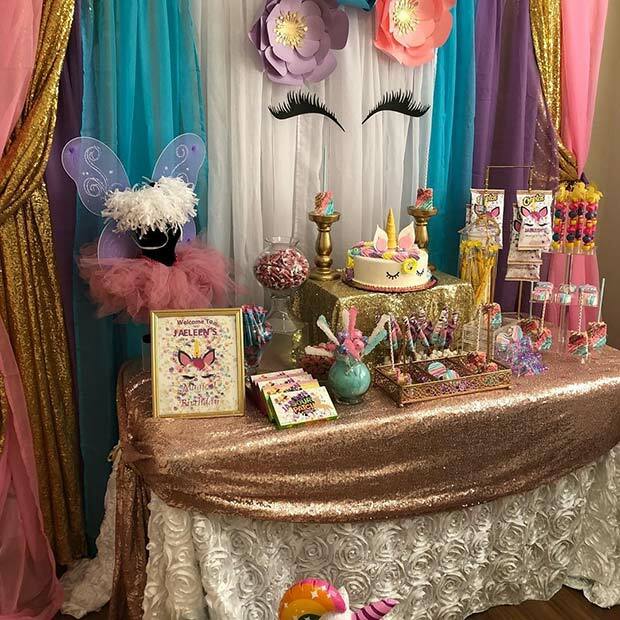 So, why not have a unicorn theme bridal shower?! A shower that uses unicorns will be fun, vibrant, creative and unique. Every guest will enjoy the event. The possibilities for food, drinks and decor are endless. We love this idea! Next, we have a vintage elegance theme. 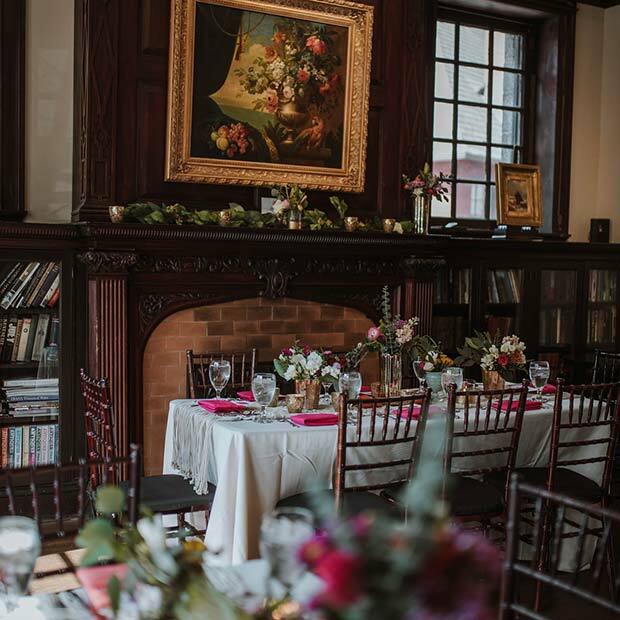 This theme is all about using decor from the past to create a beautiful bridal shower venue. Try to choose tableware that looks old fashioned and make sure you have flowers on the table. A shower like this is perfect for a vintage loving bride-to-be. A bridal shower is the perfect opportunity to celebrate in style and elegance. So, when choosing a theme and decorations, consider something glamorous. 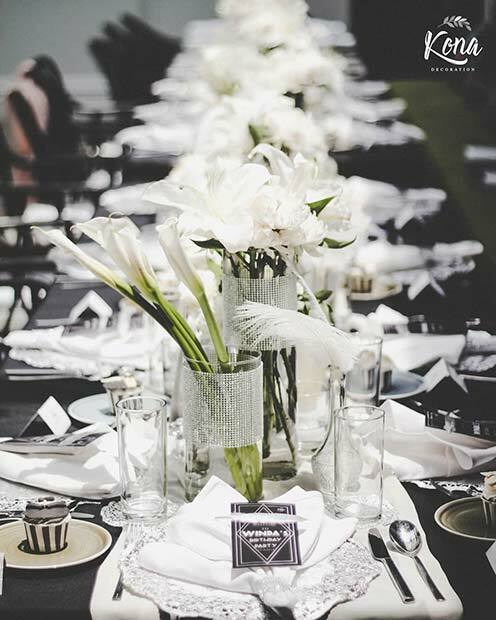 This party table features a luxury looking table with white flowers and bling. Something similar would look amazing for any bridal shower. Our next idea is perfect for the brides who are trendy and like to keep it simple and classy. It is a stylish rose gold and black theme. 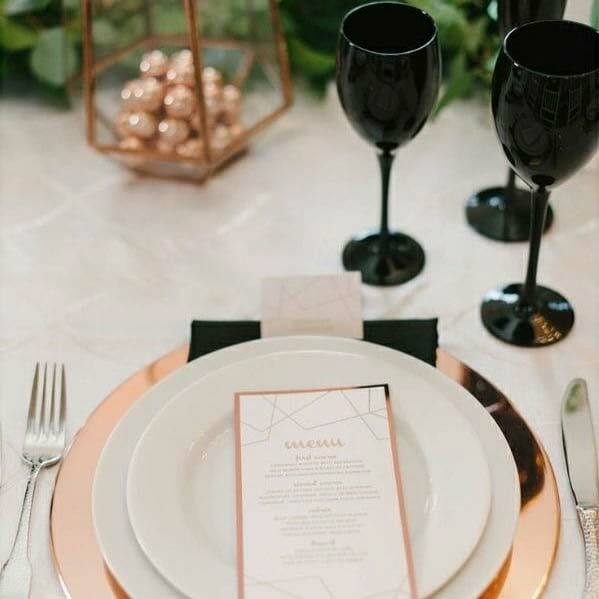 You can create stunning tables and party areas with this color scheme. It will allow any bride-to-be to celebrate in style. You can ask the guests to dress with the color palette too. Last on our list is another take on the nautical theme. 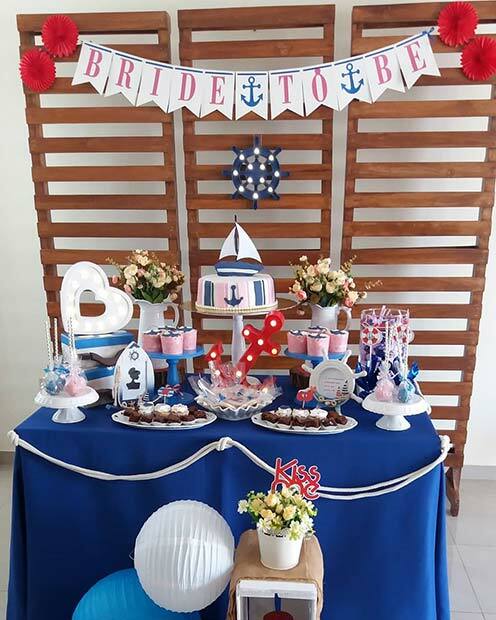 We love nautical bridal showers and know how popular they are. So, we wanted to show another way in which you can use the theme. This shower was decorated with vibrant red, blue and white. It is a simpler but bolder way to celebrate than the one we featured earlier. We love this cute idea! 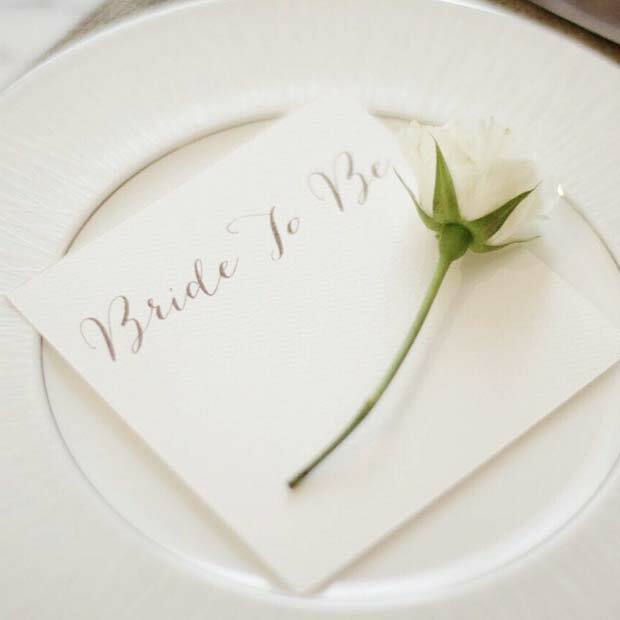 We hope you have found the perfect bridal shower theme!